The histories of the Sun Empire and the River Heralds are closely intertwined. The merfolk are a truly ancient people, whose legends hold that they were here when humans first came to this place (though they do not claim to know where the humans came from). And for a long, long time, the merfolk and the humans lived together in relative peace. The sacred forest of Itlimoc, called the Cradle of Sun's Abundance, is a legacy of this time, when merfolk and human priests worked together to invoke a blessing of fertility upon the land. Before there was a Sun Empire, human civilization arose in several city-states scattered across the continent. One of the city-states, Orazca, gradually rose to prominence over the others, thanks in large part to the charisma and cunning of its ruler, Chacanto Intli. She began uniting the other cities under her leadership. 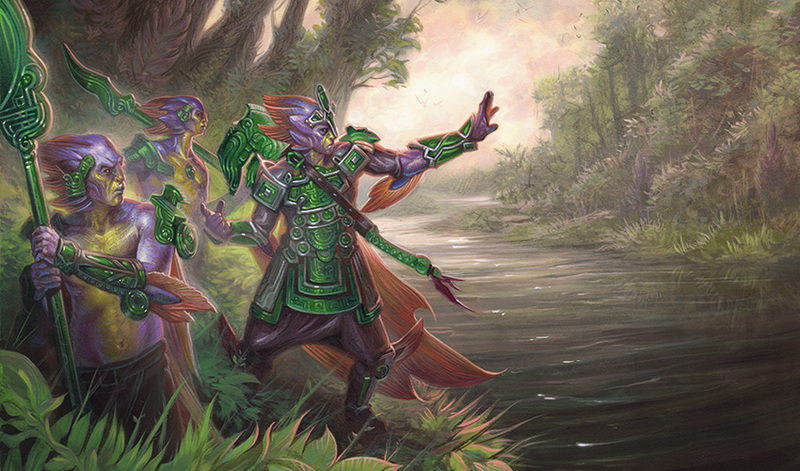 Even at this time, the humans (and the dinosaurs they commanded) did not expand into the territory of the River Heralds, and the merfolk brought goods to Orazca in trade for items they could not make themselves. Chacanto Intli transformed the scattered and fractious city-states into a mighty empire. During this period, the merfolk did something they had never done before and have not done since: they built villages, and even made a sort of city of their own. In keeping with their traditions, these settlements were shaped from and constructed in harmony with the natural environment, but they were permanent. The majestic Deeproot Tree is a surviving remnant of their ancient city, and it is still revered as a place where their ancestors dwelled. Generations later, a new ruler set his sights higher. 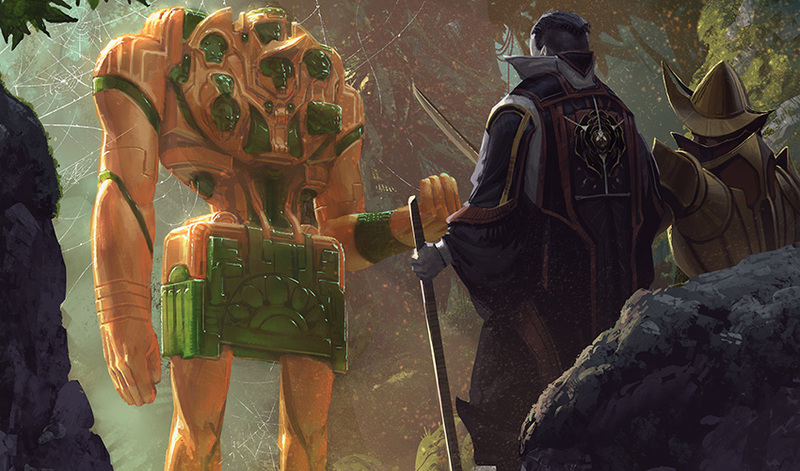 Emperor Apatzec Intli was gifted the Immortal Sun in a fateful encounter, and vowed to conquer the merfolk and raze the jungle. He wielded the Immortal Sun without any wisdom or restraint. Devastation and ruin followed in his wake, and the Immortal Sun was taken away and gifted to the River Heralds, who vowed to keep its location a secret, even from themselves. The Sun Empire was reduced to a handful of coastal cities. The emperor's heir founded a new capital, Pachatupa, but the bonds that tied it to the other cities were tenuous. During this period, three cities rose to dominate the other towns and villages belonging to the empire. Meanwhile, the River Heralds' power increased. Their migrations took them far and wide across the continent, and the jungle itself spread to reclaim the lands that had been plowed and planted by the Sun Empire. The great river grew broad and deep, tended by the merfolk shamans and fed by new tributaries called up by their magic. In recent years, a new ruler has taken the throne of Pachatupa. After years of raids from the pirate ships of the Brazen Coalition, Apatzec Intli III has forged a new, stronger hold over the other cities, fought back hard against the pirates, and even begun to expand. 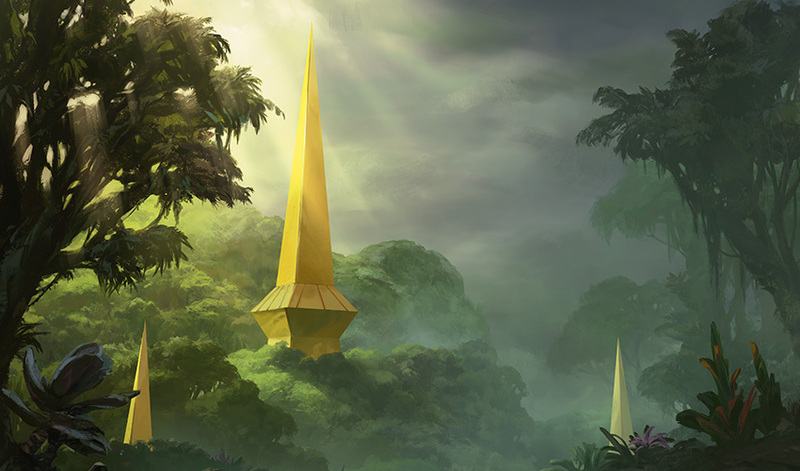 Pressing into the inland reaches and pushing back the encroaching jungle, the forces of the Sun Empire seek to reclaim their lost ancestral heritage—the golden city of Orazca and its Immortal Sun. The new ruler of the Sun Empire, responsible for the current mood of expansion and conquest, is a fierce man named Apatzec, after the emperor who abused the power of the Immortal Sun in an effort to conquer the River Heralds. He is middle-aged, having succeeded his extremely long-lived and conservative mother, and has spent most of his life chafing under her authority and anxious to prove himself as a leader and a warrior. As soon as his mother died, he set about changing everything he disliked about her rule, launching the empire into a state of renaissance—and no small amount of turmoil. Apatzec trusts in the strength of his armies and his own leadership to secure the good fortune of the empire. Despite (or perhaps because of) his namesake, he initially put little stock in the legends of the Immortal Sun, holding no faith that it would be found, let alone alter the course of history. Learning of the visions of the warrior poet Huatli, though, has convinced him that the golden city might yet be found and the Immortal Sun once again used to secure the empire's victory over its foes. He has committed significant resources to the search for the city, painfully aware that his initial hesitation may prove costly. At the same time, there are leaders who now fear that his eagerness to find the Immortal Sun is leaving the cities of the Sun Empire vulnerable to attacks by their enemies. The Emperor's Guard is an elite military force housed in the palace of Tocatli. Rigidly trained and organized, the Guard answers directly to the emperor and is dedicated to the defense of the imperial palace. Its soldiers are divided into seven squads, each with its own commander (called an intical). The seven inticals all report to the emperor, and enough rivalry simmers among them to ensure that the Guard never unites in opposition to the emperor. The Canchatan, the temple soldiers of Pachatupa, are specially chosen and blessed by the priests of two of the sun temples in Tocatli—the Temple of the Birthing Sun and the Temple of the Consuming Sun. (The third temple, the Temple of the Sustaining Sun, does not consecrate holy warriors, since its teachings emphasize stability and solidity.) They favor weapons with rounded blades suggesting the shape of the sun. Though the Canchatan are technically two military forces, they have a single commander. Caparocti Sunborn is the holy champion of Pachatupa, a fierce warrior who imagines that he is the blinding light of the sun come to smite the foes of his people. Caparocti is known for his shining helmet, which brightly reflects the sunlight. The people of the empire worship the sun in three aspects: creative (associated with white mana), sustaining and nourishing (associated with green mana), and destructive (associated with red mana). Many different parts of life and the natural world are associated with the sun's different aspects. For example, the rainy season is linked to the Wakening Sun, the cool season with the Verdant Sun, and the hot season with the Burning Sun. The white aspect of the sun represents its creative quality. Kinjalli is said to have formed humans by shaping them from clay and baking them until they were solid. Kinjalli kindles the spirit to life, sparks the intellect, and inspires creativity. The Wakening Sun is associated with healing, but also with blinding and searing wrath. It is the patron of the emperor and closely associated with Chacanto Intli, the empire's founder. Kinjalli's aspect is embodied in the imperial court, the hierarchical priests of the creative sun, and the structured ranks of the military. Other names for Kinjalli include Sun's Creation and the Birthing Sun. The green aspect of the sun represents its sustaining and nourishing qualities. Ixalli fosters growth in all things, from the verdant rainforest to the development of children into adults. The Verdant Sun is associated with strength, solidity, and community. Ixalli's priesthood is a conservative force in the empire's society, resistant to change but supportive of the people and the strength of the nation. These priests are the masters of dinosaurs, wielding powerful magic to control and restrain them. Ixalli is also known as the Fertile Sun, the Sustaining Sun, Sun's Growing, or Sun's Abundance. The red aspect of the sun represents its destructive quality. Tilonalli ignites passions, smites the enemies of the empire, and brings all life to its eventual end. The Burning Sun is associated with ferocity, fire, and love. Tilonalli is a patron of many warriors, including the holy soldiers of Pachatupa and the fierce knights of Otepec. Tilonalli is also called the Consuming Sun or Sun's Destruction. Dinosaurs are the dominant animal life of Ixalan, including apex predators and enormous herbivores as well as small egg-eaters and seed-pickers. The people of the Sun Empire live alongside dinosaurs without taming or domesticating them. Whenever a dinosaur moves through a Sun Empire city, it is under someone's direct control—and there's always the risk of it breaking free. This is part of the Sun Empire's world view: nature (embodied in the dinosaurs) is a tool to be wielded, bent to human will, but it is a constant test of will and strength. Nature can't be tamed, but when humans live alongside nature they are made stronger. Dinosaurs are important to the Sun Empire's sense of national identity. The empire's people use dinosaur feathers as decorations and as inspiration for design motifs in everything from jewelry to architecture. They believe that the Immortal Sun first gave their priests the ability to call and command the dinosaurs, so maintaining this command is a way of clinging to their ancient heritage. The people of the Sun Empire interact with a wide variety of dinosaurs. These include herds of huge, forest-dwelling herbivores, heavily armored quadrupeds, flying dinosaurs, and aggressive bipedal predators. Wind roars in a destructive cyclone, waves rise high into the air before smashing down, and vines and branches reach and grab as the shamans of the rainforest work their magic. The people of the waters, the River Heralds, wield the raw force of nature in their effort to protect their world from disaster. Living in peace and harmony with the natural world, they seek to preserve its delicate balance and drive the invaders away. The River Heralds are a collection of small nomadic tribes that were the dominant inhabitants of Ixalan before the rise of the Sun Empire. Their strength was once great enough to drive the Sun Empire out of the interior and close off the golden city, but their numbers are now greatly diminished. 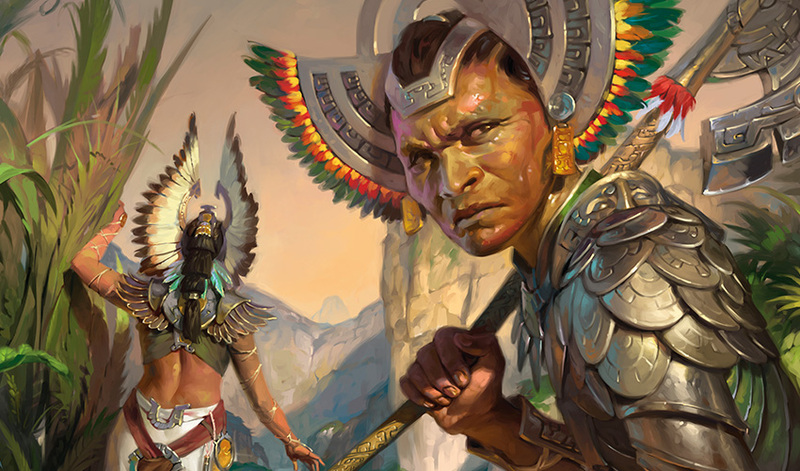 They live in harmony with the land, and their shamans wield powerful nature magic to control the elements of wind and water, which they use to protect themselves from the harsher aspects of life on Ixalan. Now the River Heralds dominate the deep interior islands and jungles, the winding rivers, and much of the sky. The River Heralds have lived in peace and harmony with the natural world for as long as they can remember. It's not that they lack the knowledge or skill to build cities and develop technology; rather, they have deliberately chosen to live as part of the natural world, partly in rejection of the path they watched the Sun Empire take long ago. The magic of the River Heralds' shamans is focused on controlling wind, water, and their jungle environment. They strive to maintain a peaceful coexistence with nature, not to conquer it or defy it. They are called Shapers for the way they alter nature around them—changing the currents of wind and water, calling up storms and floods, and bending branches and vines. As they move through the jungle, they adapt it to fit their needs—and then return it to the way it was, leaving no trace of their passing, just as a pebble dropped in water leaves the surface unchanged once the ripples have passed. The power of the Shapers is so great that even a small band of River Heralds can stand against a much larger force of Sun Empire or Legion of Dusk soldiers. They redirect rivers to thwart intruders, call up banks of fog, summon enormous waves to wash away their foes, create huge vines to destroy ships and fortresses, and direct the winds to lift them into the air or send flying opponents crashing down. 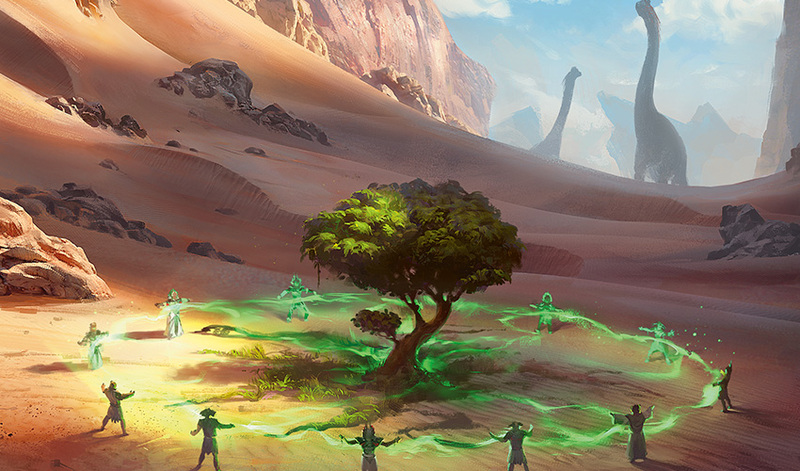 They also summon elementals—living creatures formed from water or tangles of jungle growth. To outsiders, the various bands of the River Heralds present a unified front, determined to keep intruders away from the rainforest interior and ensure that they do not find the golden city. In fact, while they share this common goal, the merfolk bands are in constant competition with each other for primacy and control of the richest territory. A merfolk band consists of about a dozen individuals, led by a shaman called a Shaper. The Shapers are respected elders and leaders who guide the decisions of their bands and lead them on their migrations—and into battle against intruders. Each Shaper has a single apprentice at any given time. Should a Shaper die, the apprentice takes over leadership of the band. If a band grows too large for its territory to support, the apprentice takes a portion of the band away to form a new band and claim a new territory. By merfolk reckoning, there are nine tributaries to the Great River that dominates the interior of Ixalan. The headwaters of these nine rivers are considered the prime territory, and the shamans whose bands control the sources are the most respected. The shamans are known by the rivers' names: Tishana, Kumena, Pashona, Vuhana, Mitica, Notana, Falani, Tuvasa, and Kopala. River Herald bands use carved pillars of jade to mark and protect their territory. From a distance, these totems seem like squat blocks with a hint of humanoid features in the ornamental carvings. When intruders trespass on the lands they are set to guard, though, blue or green light begins to shine from inside the totem, spilling out from cracks formed where separate pieces of jade begin to move apart. Soon the totem fully opens, releasing the elemental energy stored inside. An elemental guardian—a living creature formed of swirling wind, streaming water, or viny growth—takes shape around the totem core. These are powerful guardians, but creating them takes a great deal of work for both the crafting of the jade and the working of magic to bind the elemental spirit to the totem. Thus, they are too few in number to serve as an effective barrier to the armies of invaders now making their way into the River Heralds' territory. For more lore and background, be sure to check out The Art of Magic: The Gathering—Ixalan, available January 2, 2018!